The 3D Matrix images have now been deployed on renovated simulators, and will be supplied as standard on all CORYS simulators. Whether the destination is Ireland, Australia or Brazil, the reasons are the same: improving trainee immersion and pursuing new teaching goals. 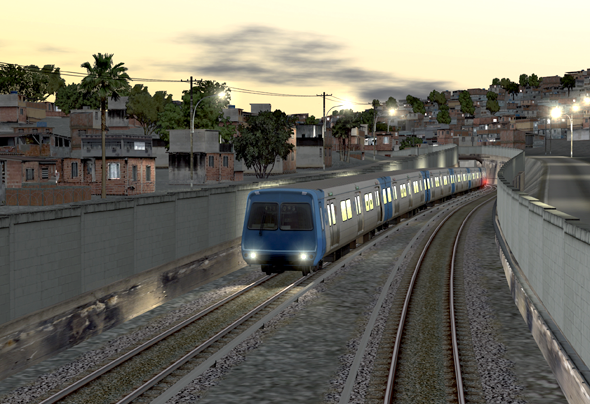 Metrorio, which operates Rio de Janeiro’s two metro lines, has yet to use simulation to train its 200 drivers. It will be introducing this new tool shortly, though, with two new installations designed by CORYS: one compact system (to be delivered in late 2012) and a replica simulator (to be delivered in mid-2013). Each will feature two models of train: the older model from Alstom and Mafersa, and a new one from CRC. Like all CORYS’ new projects, both simulators will incorporate Matrix images from the outset. The whole of Rio’s two metro lines, with a total length of 40km and 36 stations, will be covered in this new environment, as will the Metrorio depot. Belfast suburban network train operator Translink acquired a replica simulator in 2004. Following a call for tender, CORYS won the renovation contract, due to be completed in April 2013. This is a full overhaul, including replacement of both hardware and software for the instructor station. Translink decided to make the most of the opportunity to upgrade to Matrix images. The three lines delivered in 2004, totalling 50km in all, will all be switched over to the new environment. The main 3D improvements in Matrix relate to realistic weather conditions, dynamic lighting to simulate night driving, realistic shadow rendering using real-time dynamic calculation, and 3D modelled trees and moveable objects. CORYS is also responsible for renovation of the simulator delivered in 2005 to PTA, which operates suburban trains in Perth, Australia. At that time the simulator only had two CGI lines, the 30km Clarkson Line and the 60km Mandurah Line. These are being upgraded to Matrix; PTA is also using the renovation to add its Freemantle line (22km), the Midland line (16km) and the Armadale Line (30km), also using Matrix. Delivery is scheduled for May 2013. “3 D Matrix images will provide significant improvements to the Transperth simulator training functionality including route learning, a wide range of adverse weather conditions and the ability to set a frog on the mobile switches differently to the leading blade to test the driver’s ability to read the road”.